The worlds of fashion and design were drastically reinvented in the 1920s. The birth of modernism and the rise of the Art Deco movement meant that jewelry became more than just flaunting your gigantic gemstones to show everyone how wealthy you were, it was about the sleek, sophisticated streamlined shapes that came to define the new era. 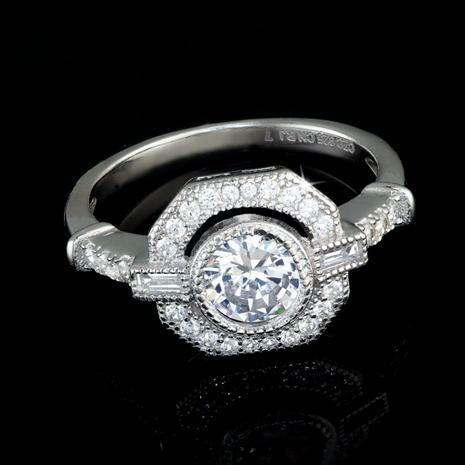 The Art Deco Fringe Ring is a fine example of an Art Deco masterpiece, updated for the 21st century. Created from thoroughly modern lab-created DiamondAura® gemstones that emit flashes of fire and brilliance as light strikes the surface, much like the sparkling fringed dresses worn by the spirited Flappers of the 1920s. Set in sterling silver, Art Deco has never looked more elegant. At its core, Art Deco is about the basic mathematical formula of geometric shapes and patterns repeating to create unexpected beauty. We’ve done our own math to create an unexpectedly beautiful price tag. The Art Deco Fringe Ring is priced to be affordable, so it’s never been easier to reinvent your look and step into the modern world.